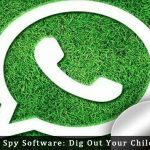 WhatsApp Spy Software: Dig Out Your Child's Secret! As you would be using your Smartphone for doing different kinds of jobs, including personal and professional, the small screen of your Android or iOS-powered device might become a huge problem, especially while managing data. Here comes the importance of making the screen a bit larger, not physically but through help of superb applications. In order to help you in such situations, we would like to introduce one of the best tools for managing your Android Smartphone or iPhone from your PC – Moborobo. According to our experience, Moborobo is the optimum solution for the purpose. Moborobo – What is it? Moborobo is a free, third-party data manager, using which you can manage your Android Smartphone or iPhone from your computer screen itself. For instance, if you would like to download and install an application to the device, you can do it straight from the PC. This free application, available for Windows-based PCs, will definitely help you, as it has many features to advance the management process. You have just to download the 23MB weighing file from official website, and the installation is quite simple. You have two options for connecting the Smartphone with your PC – through USB or Wi-Fi. 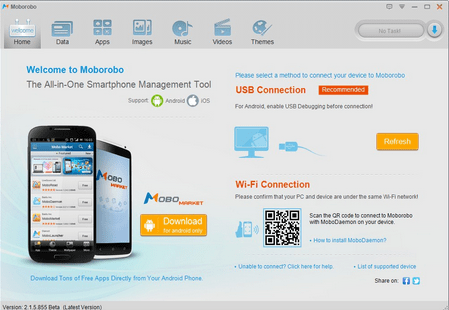 However, if you want to avail all features of Moborobo, you have to choose the USB Method. You just have to plug-in your device via USB, and the software will do rest of the job. Nevertheless, in some cases, you will have to install the USB drivers of the device to establish the connection. 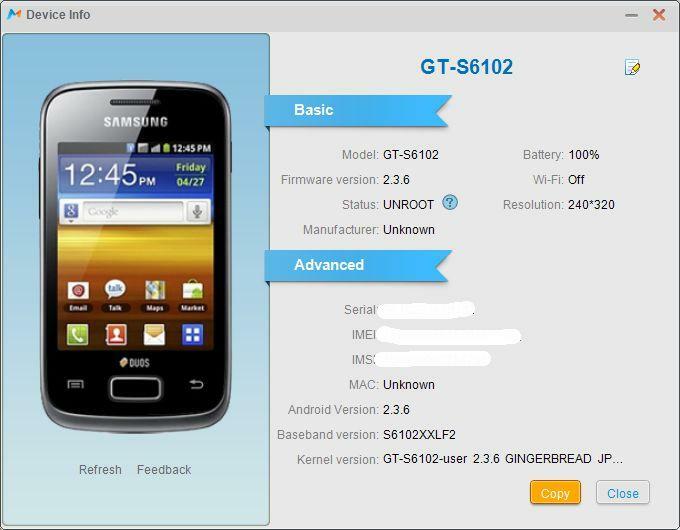 In addition, as of our experience, the tool offers support for even some basic Android devices like Samsung Galaxy Y whereas most of other tools do not do so. Moborobo – What It Can Do? Moborobo would help you in keeping your entire essential information safe through a few clicks. In addition, when you have purchased a new device, you can use the restore option to save all those information to the device. You can save different kinds of information such as contacts, messages, call logs, media, and apps and so on. Unlike most of third-party management applications, Moborobo offers extended control on calls and SMSs. You can send new messages from your device through PC as well as replying to new messages. In addition, you can give instructions for making calls from the device, but you cannot talk through the PC. The last feature makes sense if you have connected the device via Wi-Fi. Right after connecting your device to PC, you can see a welcome screen of Moborobo, where different kinds of info such as memory storage status, battery status, firmware status, etc along with a LIVE STREAM of screen of device. 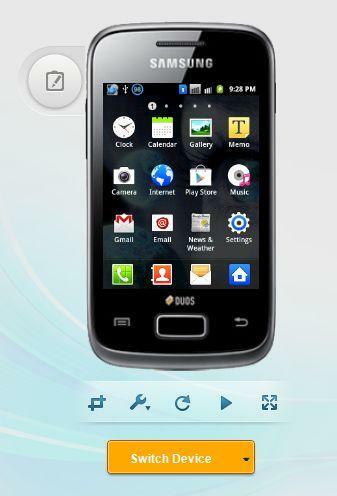 In that screen, you can see what is happening on the device as well as take screenshots through single click. Moreover, there are features for going full-screen. Also in the section ‘Device Info’ you can get information about the device, including whether it is rooted, IMEI number etc. There is an extra feature to insert a memo and hence copy specific text to the clipboard of device. Here comes, perhaps, prominent feature of Moborobo. Using this section, you would be able to manage applications that you have installed in the device. You can install new applications, manage system applications (please be careful here), use the application updater for massively updating all your applications through the internet connection of PC. 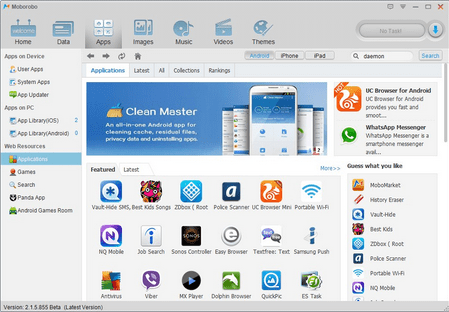 There is a platform called Mobo Store, from which you can download new applications for your device. This feature is very useful, especially if you have a good internet connection with your PC but lack one in Smartphone. Once you have connected the device to PC using USB, managing your media contents is quite easy. You can use the tool for managing, music, images, video and other types of media. In addition, Moborobo has different sections to manage each kind of media file, which makes enough sense. In addition, they have special platforms such as the wallpaper centre, MMOSITE Video, Theme centre etc, from which you can download media files such as wallpapers. Using the section ‘Data’, you can manage different kinds of information regarding your device such as contacts; you have stored, SMS messages, call logs etc. We have to mention the case of contact manager since contact manager is very useful, when you have to edit contacts massively. In addition, in three of these sections, you have options for exporting, importing, and editing those logs. 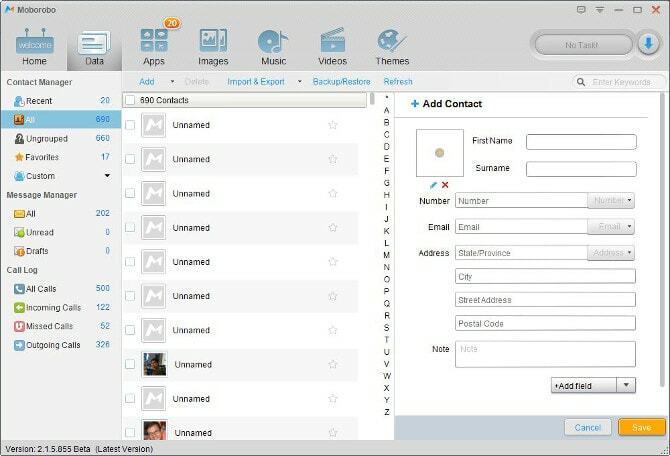 Moborobo comprises a simple-but-great User Interface, which does its best while using the tool to manage your info such as media, files, and contacts, call logs, etc. As we noted earlier, this UI makes Moborobo usable for majority of users regardless their expertise. As a whole, Moborobo is something great, and it is one of the best third-party Android and iOS managers, you can get from web. We should also mention the fact that the tool is completely free, which makes enough sense. What do you think about Moborobo? We are waiting for your comments. nice and very detailed review. I use moborobo, too. It supports both Android and iOS system, and that makes it easy to transfer contacts and files between my iPhone and samsung i9300. I can’t wait to try it. sometime really hard for me to manage my device. Does the app support two-way syncing? Such that it automatically takes the most recent from PC or Smartphone to overwrite on the device that has the oldest version. The applications looks like “snap pea” which i’ve used for my low budget tablet. I really love this new application. I’m gonna try it soon enough. I was truly unaware of Moborobo data manage software, that I wonder with the development that it manage both the Android and iOS devices. Which to get installed. Thanks for sharing this newer technology here.